SEO is a popularity contest - almost like being named prom king or queen. Except that in this contest, brains beat brawn. The search engine popularity contest is complex. And unless you know the rules of the game, you’re unlikely to succeed. Google alone has hundreds of ranking factors they take into consideration. And there’s a long list of other variables, such as social media, all having indirect effects on SEO. Today though, we’re going to drill down on one of the most important ranking factors. The factor that the Search Engine Journal listed as number one in its list of eight major Google ranking factors. If you don’t know what backlinks are, why they’re important, or how to get them, don’t worry; we’re going to teach you everything you need to know. Let’s start with the basics… what are backlinks? Backlinks are links from other websites that point to your site. When search engines judge your site, they take a close look at all the links that are pointing to your site. They examine the quality of your links based on the relevance and the authority of the websites linking back to you. That’s why a link from a local real estate news website is valuable for apartment marketers. It’s authoritative because established news sites are generally trustworthy in a search engine’s eyes. And it’s also relevant because it’s related to real estate. That being said, it’s all relative. If your competition has no backlinks, you can outrank them even with a few decent links, as long as they’re real. Search engines will know (or soon figure out) if you’ve purchased a link or earned a link in an unsavory way. That’s a no no and will end up doing more harm than good. For a quick and dirty measure of authority, download the Moz bar. It’s a free browser add on and gives you an estimate of the authority of the website you’re looking at. Create great content and the links will come. And while we appreciate the sentiment of this advice, it doesn’t always work for an apartment marketer. Especially if you’re in the middle of a lease-up with a year-end mandate to stabilize the building. After all, you may be struggling to find the time to create great content, leaving little time to wait until you maybe get a backlink. Now you may be thinking... what about local link building? We’ve also faced the local link building challenge at apartment communities across the nation. And we found that, while great content is a prerequisite for links, it’s not the only one. To build local links, you also need to develop a targeted approach in the way you create and promote content. It’s this targeted approach, in addition to great content, that will help you earn authoritative, relevant backlinks. Score! 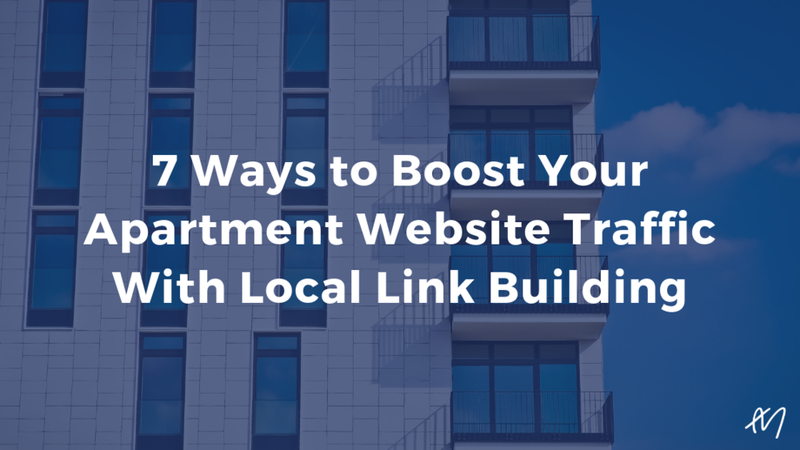 With the basics in mind, let’s dig into seven local link building tactics for apartment marketers. It’s now really cool to be green, especially in real estate. So cool, in fact, that you can pick up some super relevant, high authority backlinks by promoting the sustainability of your building. Does your building have any environmentally friendly certifications? Use them to your advantage! There are several more certifications available, depending on your location, type of building, etc. Many of them (except Energy Star) require fees partially based on the number of units in your building. Also, these certifying bodies usually have business directories where you’ll get a link. 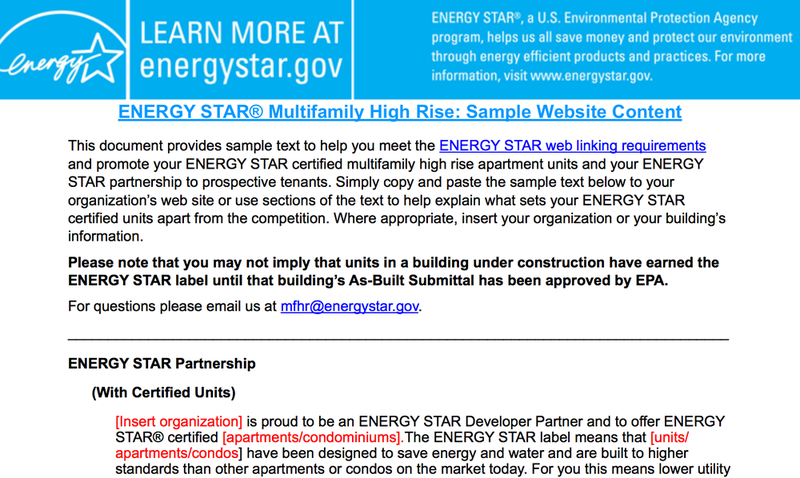 Energy Star even provides documentation about their web linking policy for Multifamily High Rise developers (shown below). 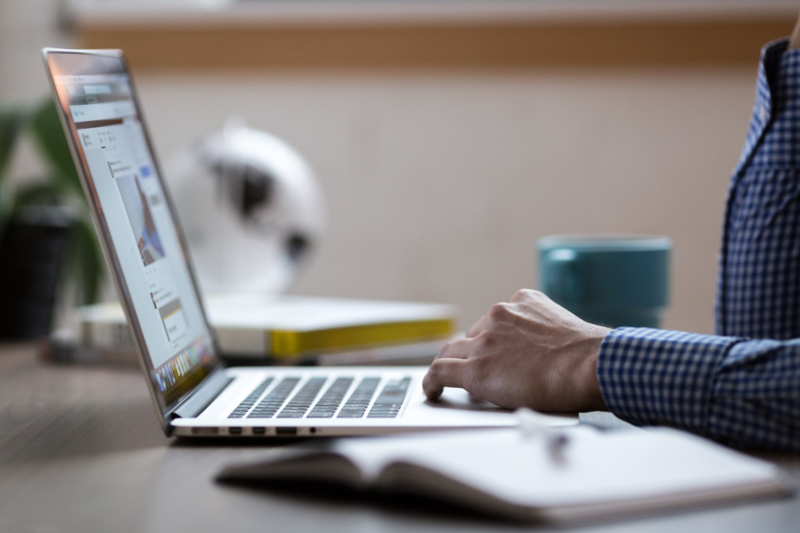 A link from any recognized certification site will be a great link for your website due to the fact that they’re relevant (related to multifamily buildings) and highly authoritative. Your city may also have less well-known green certifications that could result in a great local link. But even if you can’t find local green certifications, you can use the media to parlay a green certification into a local link. Itching to know how? Keep reading to find out. First things first, develop a mutually beneficial relationship with local reporters. Sound easy enough? Start with an understanding of what to pitch and how to pitch it with the reporter’s perspective in mind. What do they want that you could provide? HINT: Reporters want something to write about. Specifically, they want a story… even better, an exclusive story. As someone on the inside of the real estate industry, you’re a great source for that kind of story. Every once in a while, you’ll have exclusive information. There are three types of stories you can provide. Industry Trends, Data, Statistics: You could pull interesting data from something as simple as the MLS. People are always curious about prices, especially if they’ve fluctuated significantly. Reports on new construction are also a compelling topic for real estate journalists. Find out what local reporters generally write about in your area as it relates to real estate. Then, be on the lookout for opportunities to provide them that data before it becomes widely available. Exclusive Stories: In the digital age, journalists love to be first. Again, you don’t have to reveal anything that shouldn’t be revealed. Instead, you could build a false sense of exclusivity. For example, you could offer select journalists a sneak preview of the building or “privileged” information about construction progress. Make them feel as if they are getting the inside scoop! Green Certification Stories: Announcing a notable green certification and detailing what that certification entails is a solid bet to get the attention of the press. In this way, you extract even more value from your certifications. Knowing you can pitch these stories isn’t enough though. You also need to be smart about who you pitch to. An exclusive sneak peek into your new apartment building isn’t going to be attractive to a journalist who reports on national apartment trends. But, it might be interesting for a reporter who exclusively covers new construction in your market. Do a quick Google search to find reporters who will make a good target. And voilá, the image below demonstrates the first result on the page, giving me my first potential media contact and the starting point to a mutually beneficial relationship! When searching for media contacts, don't forget to prospect for bloggers with a good following as well. To build links, you’re going to have to send cold emails. 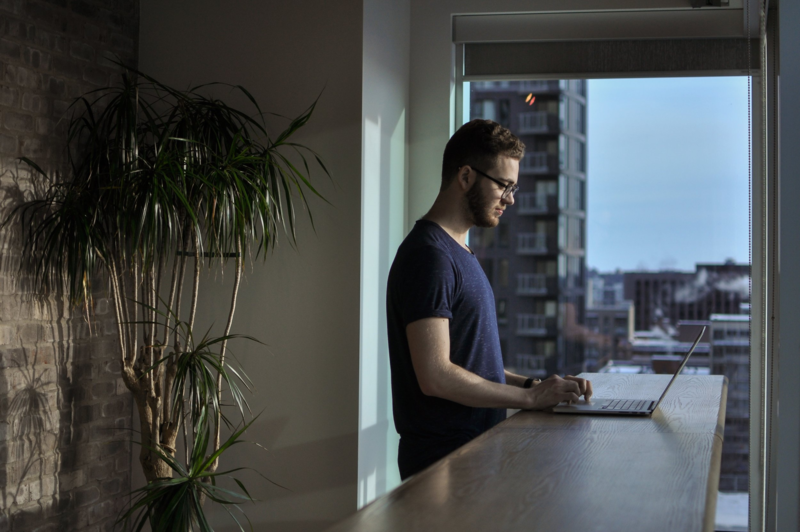 As with any cold emailing technique, you’ll want to do everything you can do upfront to increase the chances of a response. And that starts with finding the right people to email. The skyscraper technique addresses the challenge of finding the right people. It gives you a list of people that are highly probable to want to link to your content. To help you understand this technique, I’ll run through a quick example. 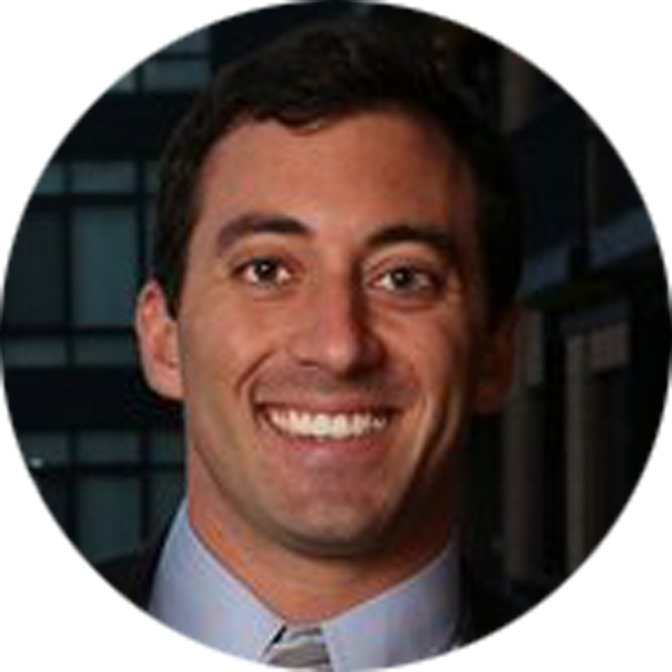 Let’s say you want to create a local resource that will appeal to apartment prospects. Don't be afraid to go past the first page of Google for potential linking prospects. Now, take a quick look through these articles. Pay attention to the design and the depth of content as you do so. Try to get a feel for what’s missing or what you could improve on. When I click through these resources I have to admit, the first one is pretty damn good. But the other top three resources don’t blow my socks off and leaves room for improvement. Before I start creating a new and improved version though, I’m going to find out who’s linking to these resources. The websites that are linking to these resources are the ones that I’m going to target for links once I’ve created a new and improved version. There are a variety of tools that you can use for this, but we prefer Link Explorer from Moz.com. All you’ll need to give them is an email address and you get free but limited use of the tool. For this tactic, you won’t need anything more than the free version. 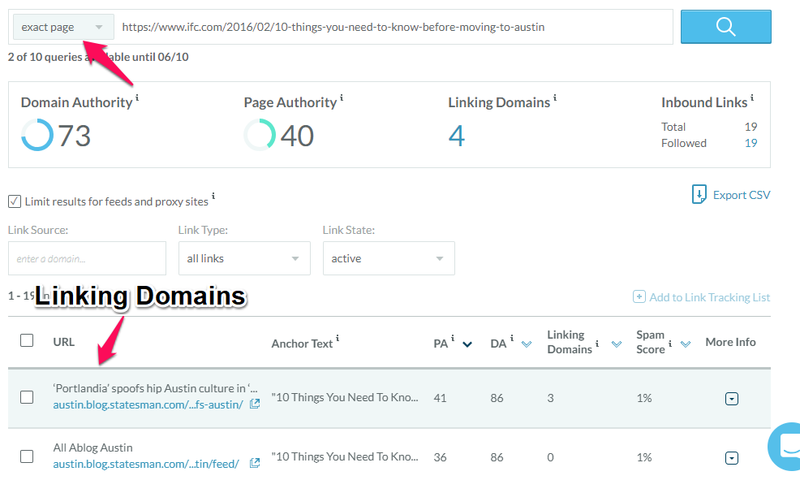 Once you’ve got the tool, grab the URL of each of the articles you’ve identified and comb through all the pages that are linking to these articles. Once you press enter, the tool will spit out all the domains and the specific pages that are linking to the URL you’ve entered. Pay close attention to the context of the link to understand whether or not it's a good opportunity for you. Now, you’re going to go to each of those pages and get in contact with the authors. 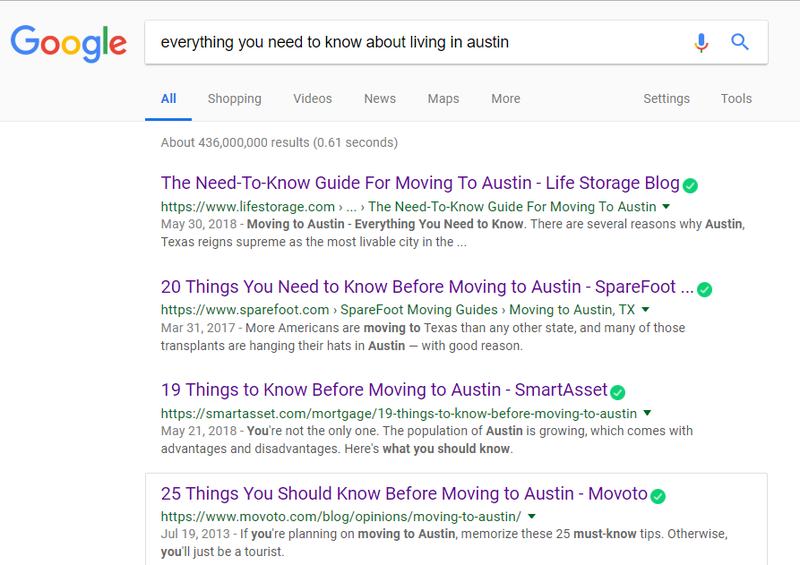 Since these people have already shown that they’d like to link to articles that talk about the things you need to know before moving to Austin, they’re likely to want to link to your article as well. Especially if it’s better than the one they were originally linking to. It’s a win-win! When you pitch them, make sure to mention that you’ve created a more in-depth, updated version of the article they originally linked to. By presenting it in this way, you’re doing them a favor because you’ve created a better asset for them to share with their audience. We can get so much value in terms of SEO out of things we already do. It just takes some awareness and consideration of who would want to link to your site and why they’d want to do so. This is especially true when it comes to holding an event. Obviously, hosting an event is about more than SEO. 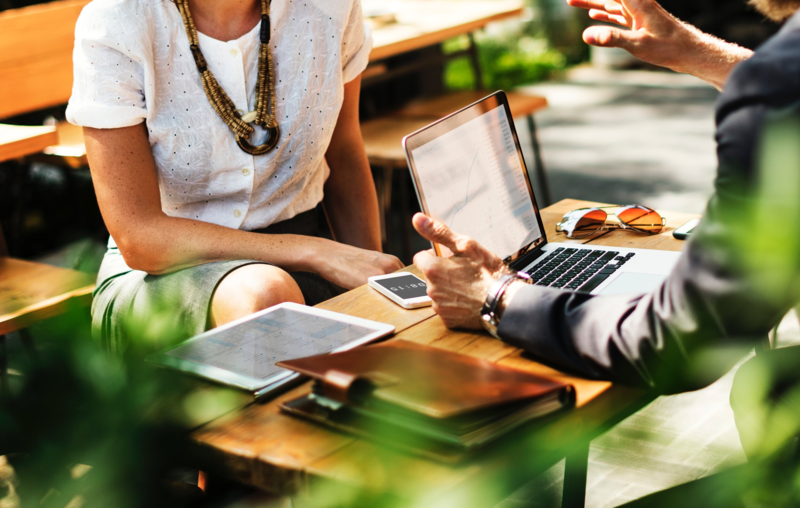 But by being intentional about your event and SEO, you can earn links from event directories, community websites, local chambers of commerce, the media, and local influencers. Here’s how to create a digital presence for your event that boosts SEO. Post Your Event: There are several event directories you can post your event to that will provide a link. While these will be nofollow links, nofollow links are still valuable for SEO, despite what you may have heard. Hold the Event at Your Location: If you want to maximize the local SEO benefits of holding an event, be sure to hold it at the address of your business. This way, your community’s name, address, and phone number will be more closely associated with your website. Contact Community Websites: In many cases, you can do a quick Google search to find local town or community websites with information about local events. Reach out to these websites to get your event listed. Create and Optimize an Event Page: Every page should be optimized according to SEO best practices, and event pages are no exception. You can use many of the tips in our post on optimizing blog posts to create an SEO friendly event page. Make sure to create a clear and descriptive URL and meta description. Also, use title tags where appropriate and implement keywords when it makes sense. In just about every city across the country, you’ll find local business awards. In addition to generating good press, getting your apartment community recognized as a local business can earn you links. Even better, in many cases, you’ll only need to get nominated to earn the link and some publicity. Depending on the nature of the award, you could also pitch the story to the local media. By doing so, you’re building off of buzz that’s already gained some momentum. Finding contests is very simple. Just do a Google search like the one shown in the image below. Using the above syntax in a Google search makes it so results with both these exact phrases show up. It does take time to apply to these contests so be selective, and only pick the ones that you think you’ll have a good chance to get nominated for. To help speed up the search, I’ve tweaked a search method suggested by Casey Meraz to use for finding business contests. Note that the last one is for a young entrepreneur contest. This kind of contest could help earn you a backlink as well. 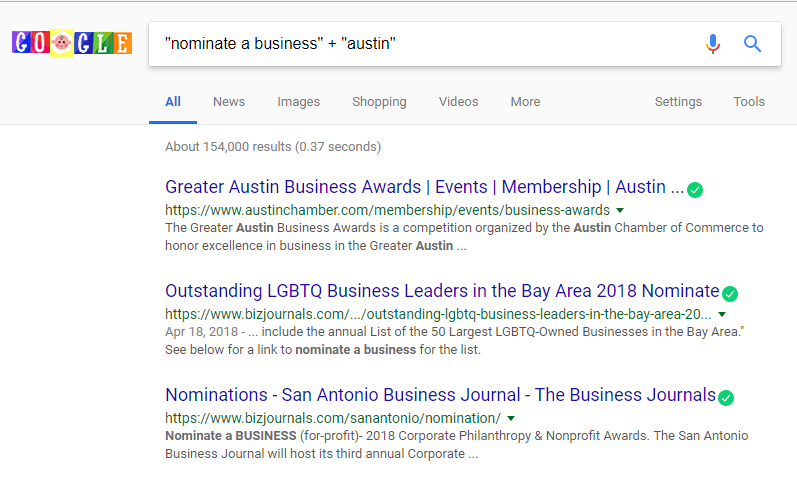 Using these searches, I was able to quickly find two contests in Austin, one put on by the Austin Chamber of Commerce and another called the MAX Awards. Finally, you should also check with local or state apartment associations for potential business awards. Successfully earning links is just as much about creating great content as it is about building relationships. However, as we’ve previously mentioned, it can be a challenge to find people that have a reason to link to your site and are willing to do so. Apartment marketers, though, have a distinct advantage because there are so many complementary businesses in real estate. Think about all the people that have helped (and continue to help) build and run your apartment community. Architects, general contractors, handymen, and more are all complementary businesses from which you could potentially earn a link. 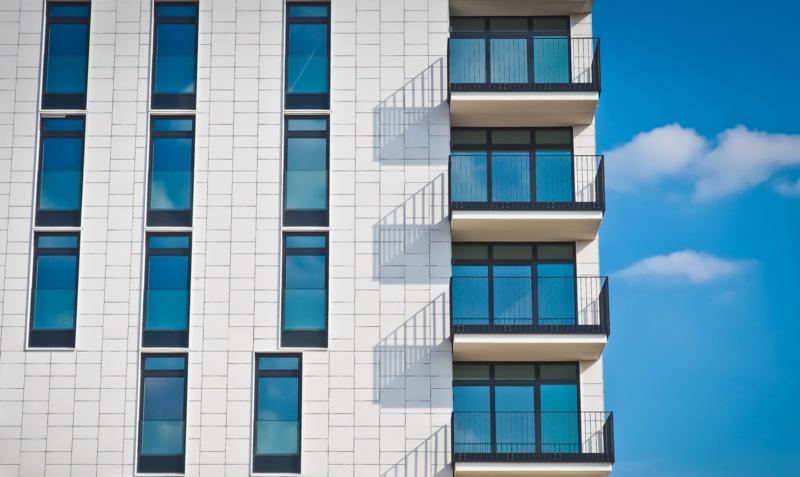 Architects and contractors in particular tend to like to show off their work on their websites, meaning a link to your apartment community website would fit right in on their portfolio page. Find out if your building is on anyone's portfolio page and ask for a link if there isn't already one. Building citations as an apartment marketer is worthy of an entire post. However, it’s so important to be aware of, we’ll give you a brief overview here. As an aside, building citations is usually thought of separately from building links. But we’re including it here because like building links, it helps your presence in search engines and provides more links to your site. According to Moz, Infogroup, Axiom, and Neustar Localeze are the big boys when it comes to citation providers. You’ll want to start by submitting to one of these sites, which will then push information about your business to a bunch of external websites. Some of these sites will provide links to your website, but most of them will be nofollow, which means you don’t get a direct SEO benefit. However, the magic of citations comes when you manually search for local business directories or other 3rd party sites that provide relevant, authoritative links. 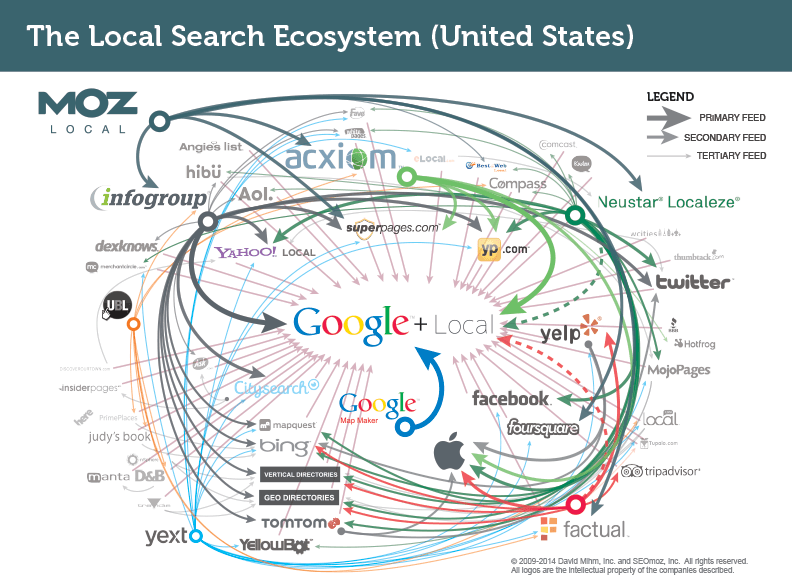 We provide you with a complete guide to several of the tactics you can use to find valuable local citations and consequently, valuable local links in our post on local SEO research. The most consistent, repeatable way to build links is to provide value. Find and create a story for a journalist. Hold an event that people want to talk about. Create great content for people who want it. You provide value. You get links. Don’t make the mistake that many others do... creating great content and expecting links. Instead, sell your content. Find the people who’d want it if they knew about it. Pitch them. Try thinking about it this way, you wouldn’t expect to find renters quickly for your community just because you built a great building. So get out there and start earning those links!